He also voiced Jabba the Hutt's staffer Bib Fortuna in the same film. He returned to voice Ackbar in last year's J.J. Abrams-directed blockbuster Star Wars: The Force Awakens. Bauersfeld's other roles include voice work in last year's Guillermo Del Toro film Crimson Peak and Steven Spielberg's 2001 film A.I. Artificial Intelligence. "The voice work I did in movies was accidental," wrote Bauersfeld on the website for his non-profit, Bay Area Radio Drama. "I was working with Randy Thom on radio dramas at his technical quarters at Lucasfilm. One day Ben Burtt, sound designer for Star Wars, came by and asked if I would audition for a voice in the movie." 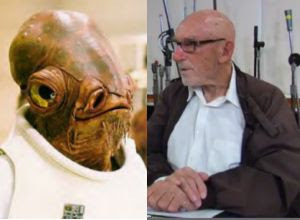 He is also credited with voiceover work for the Ackbar character in Star Wars: X-Wing, a 1993 flight simulator video game. I have to say this is especially sad for me, because I have a special fondness for Admiral Ackbar. He's one of my all-time favorite Star Wars characters. Yes, because of his iconic cry of "It's a trap," but also because he's such a unique character. He looks kind of silly with the head of a squid, but has such a gruff and commanding voice. When he did a cameo in Force Awakens, I almost cheered, knowing he was still alive in the new universe. Even if they replace his voice, it won't be the same. Also check out this great interview with Bauersfeld about his role in the movie, and his thoughts on the character. Happy trails, Mister Bauersfeld. We couldn't repel greatness of your magnitude. What did you think of Admiral Ackbar?